Click here for this volume's document. Spatially interpolated precipitation frequency estimates (with upper and lower bounds of the 90% confidence interval) area available in GIS compatible format (ascii file). For default download page click here. Cartographic maps of precipitation frequency estimates were created for selected average recurrence intervals and durations. We recommend that these color maps are used as visual aids only. For default cartographic maps' page click here. Temporal distributions are provided for 6-hour, 12-hour, 24-hour, and 96-hour durations. The temporal distributions for the duration are expressed in probability terms as cumulative percentages of precipitation totals (see documentation for more information). To provide detailed information on the varying temporal distributions, separate temporal distributions were derived for four precipitation cases defined by the duration quartile in which the greatest percentage of the total precipitation occurred. The seasonality graphs show the percentage of precipitation totals for a given duration that exceeded the precipitation frequency estimates for the duration and selected annual exceedance probabilities in each month for each region. The precipitation frequency estimates were derived from annual maximum series at each station in the region (as described in documentation). Results are provided for 60-min, 24-hr, 2-day, and 10-day durations and for annual exceedance probabilities of 1/2 (or 1-in-2), 1/5, 1/10, 1/25, 1/50, and 1/100. Seasonality graphs should not be used to derive seasonal precipitation frequency estimates. Rainfall (liquid precipitation only) frequency estimates are not available for this area (currently only available for California, Colorado, and South Dakota). 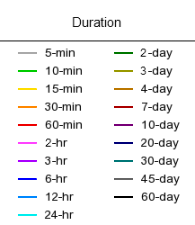 Rainfall (liquid precipitation only) frequency estimates are provided for durations between 1 and 24 hours in addition to precipitation frequency estimates. Please refer to NOAA Atlas 14 document for more information. 1 Rainfall frequency (RF) estimates in this table are based on frequency analysis of . Numbers in parenthesis are RF estimates at lower and upper bounds of the 90% confidence interval. The probability that rainfall frequency estimates (for a given duration and ) will be greater than the upper bound (or less than the lower bound) is 5%. Estimates at upper bounds are not checked against probable maximum precipitation (PMP) estimates and may be higher than currently valid PMP values. Precipitation frequency results are based on data from a variety of sources, but largely from the National Centers for Environmental Information - NCEI (formerly National Climatic Data Center - NCDC). For more information about observing sites in the area, regardless of if their data was used in this study, please visit NCEI's Climate Data Online. For detailed information about the stations used in this study, please refer to NOAA Atlas 14 Document. Click here to get the watershed information for this location from the U.S. Environmental Protection Agency's (EPA) site.